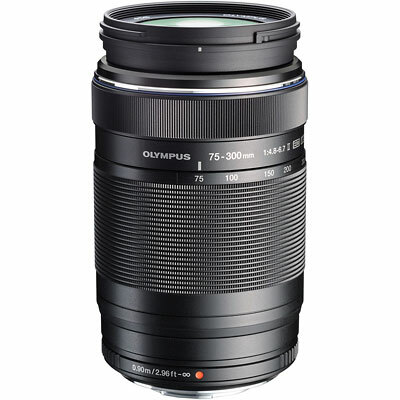 The Olympus M.ZUIKO DIGITAL ED 75-300mm f/4.8-6.7 II Lens is a telephoto zoom lens that is compatible with the Micro Four Thirds standard. The 75-300mm focal length gives a 35mm-equivalent zoom range of 150-600mm for a standard to super-telephoto reach. The lens construction integrates one Super ED (extra-low dispersion) and two ED lens elements to help minimize chromatic aberrations throughout the zoom range while also contributing to overall image sharpness, clarity, and color fidelity. Three HR (high-refractive index) elements are also incorporated into the design to reduce the overall weight and size of the lens and also promote an overall higher image quality. Lens elements also feature Olympus' ZERO (Zuiko Extra-Low Reflection Optical) coating to reduce internal and surface reflections and ghosting that are more prevalent when shooting in difficult lighting conditions, such as backlit situations. The ZERO coating also provides greater durability to the lens surfaces. The MSC (Movie & Still Compatible) autofocus system provides quick, accurate auto focusing that is especially suited to working with fast-moving subject matter. By employing an internal focusing mechanism, the lens is also able to function in a quiet and smooth manner that greatly benefits its use when recording movies. Compatible with Micro Four Thirds system standard. One Super ED and two ED lens elements help to reduce chromatic aberrations throughout the zoom range while also providing increased image sharpness and clarity. ZERO coating minimizes reflections and ghosting while also contributing to increased durability for the lens surfaces. MSC autofocus system provides a quick, quiet, and accurate focusing performance that suits photographing fast-moving subject matter as well as recording movies. Seven-blade circular diaphragm offers a smooth, aesthetic out-of-focus quality to shallow depth of field imagery.